Whether you’re a professional athlete, weightlifter, sports enthusiast, or just beginning to work out, you’ve probably thought about using supplements to enhance your training or hasten recovery from injuries. But one look at the supplement section at the health food store or at your gym may have given you second thoughts. There are so many sports supplements available today: protein powders, amino acids for muscle building, fat-burner nutrients,, and so on. You may have wondered, do I really need to take supplements? Which ones should I take? And how do I know the good one from the not-so-good ones? 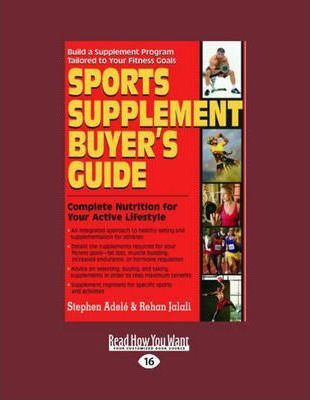 This book will help you sort through the overwhelming array of sports supplements and come up with a supplement regimen to fit your specific needs and goals. For the active person, it is vital to maintain a good nutrient intake to avoid basic nutritional deficiencies, help prevent injuries, promote the health of specific body systems, and accomplish training goals such as building muscle mass or burning fat. “The Sports Supplement Buyer’s Guide” provides a unique integrated approach to supplmentation for athletes, including essential nutrients for building a strong body and supplements for specific fitness goals: fat loss, muscle builing, increased endurance, and hormone control. Plus, there’s advice on selecting, buying, and taking supplements in order to reap the most benefits. Supplement programs tailored to the physical requirements of specific sports are also included.